This week we had to create thumbnails of environments (and props) that could conjure an emotion/feeling/sense of place at a quick glance. The emotions I’m aiming for below the cut! Let me know how you think I went and/or which is your fave, bc I’ve gotta carry at least one through to a full greyscale picture. I created these characters for a commission. The idea is that you can drag and drop them into photographs and make little comics where the kids are discussing concepts and ideas and arguing and learning. I’m about to do another round (each kid gets two poses) but I thought I’d pop them all up and remind myself of who each of the kids are before I get into sketching again. 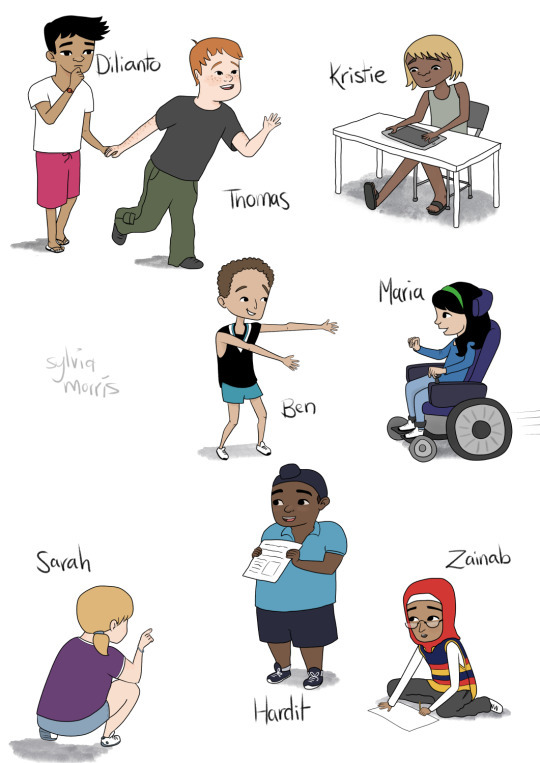 Thanks to all of you who sent me messages and comments about representation you missed out on in primary school. I found it enormously helpful. If you want to use these characters, please contact me (email is in my sidebar). ideas for a super cool personal project that will be a long time in the making.